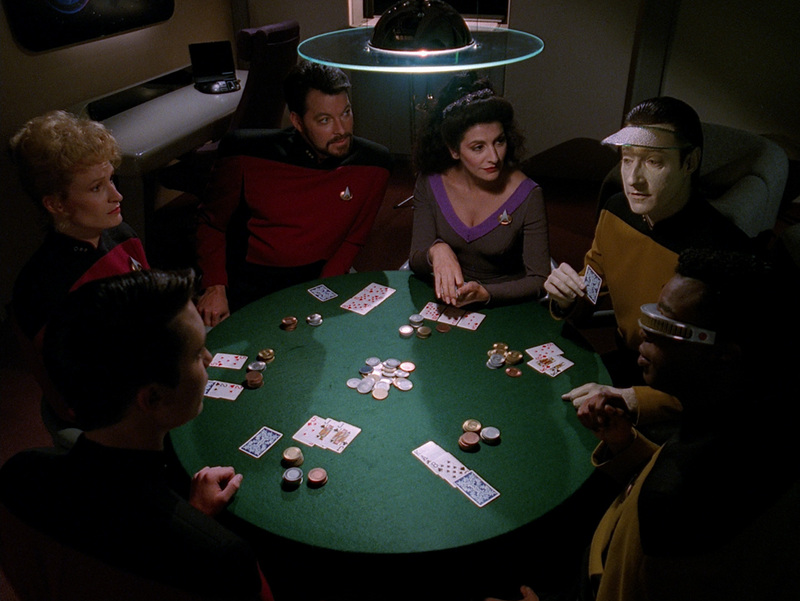 I'm curious who in the TNG crew would perform the best in poker if everyone used any natural talents they possess to cheat during the game. Deanna Troi being part betazoid should be able to sense whether someone's bluffing as well sense the strength of their hands except for Data's . Laforge has the ability to see if someone is bluffing as well based on this quote from "Up The Long Ladder"
LAFORGE: Commander, with this I can see better than your average person. Now when someone lies there are certain physical manifestations. Variations in blush response, pupil dilation, pulse, breath rate. Doesn't always work with aliens, but humans? Got'em nailed. Laforge may also be able to see everyone's hand based on this quote from "Ethics"
LAFORGE: Let's just say I had a special insight into the cards. Maybe next time you should bring a deck that's not transparent to infrared light. Not to worry, Worf. I only peek after the hand is over. Still nothing. I'll get a dynoscan. We'll try again. Data has the ability to rig the deck so that everyone gets any card he wishes as he's demonstrated in episode "Cause and Effect"
CRUSHER: I've been having the same feeling. Wait. An eight, an Ace, a Queen and a four. Deal the cards, Data. CRUSHER: I was positive I knew what cards were going to be dealt. WORF: I was also sure. RIKER: Finish dealing the hand. RIKER: Look at this, we've all got three of a kind. CRUSHER: First we get a three, and then three of a kind. Plus Data can compute the odds behind every hand to have a mathematical edge in the game. I'd say Riker is probably the best player when there is no cheating involved. But is that enough to overcome all this cheating? If not, who would be the most successful player at the game when cheating is allowed?